We, like millions of others love Lego. We grew up with Lego and now our kids love Lego too. But as the world’s largest toy firm we know the brand carries massive cultural sway. For a super-brand such as Lego to positively represent disability would have an amazing impact on the self esteem of kids with disabilities. 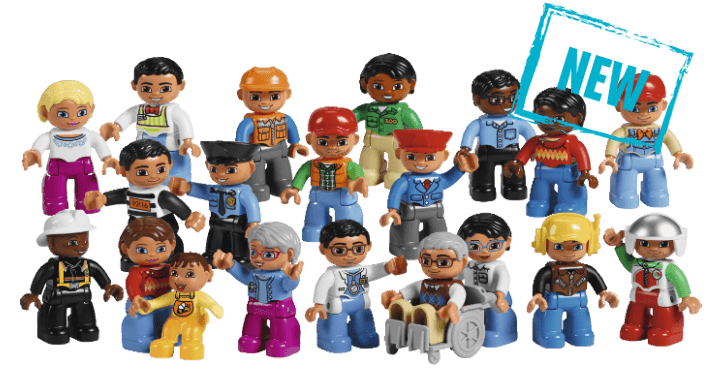 But also incidental disability inclusion in Lego products could send a powerful message to ALL children. But in disability representation ‘positive’ is the operative word. The scant representation of disability in children’s industries (TV shows, films and toys) has long fallen into three enduring stereotypes, none of which are very positive or promote self esteem in children with disabilities – The elderly (grandparents with sticks and wheelchairs), the evil (pirates with patches and hooks as manifestations of wrongdoing) and the sick or medical (the disabled body as broken and fixable with a stay in hospital). As part of the #ToyLikeMe campaign we’ve made-over countless toys giving them disabilities to create an entirely new aesthetic by mixing fantasy, celebration and vibrancy with impairments. Whilst we applaud Lego for including a wheelchair user in their Lego Education Community Set we are disappointed with the design of the wheelchair which is grey and medical in appearance and does not appear to have wheels that turn, as well as the choice of the elderly figure to use the chair in promotional images. There is a pervasive stereotype that disability is the preserve of the elderly when in fact 70,000 children in the UK use wheelchairs. Unfortunately this elderly figure doesn’t celebrate childhood disability in any way. Whilst we know many older people have disabilities, a large part of the problem occurs when you only have one character with a disability because by default you create a tokenistic stereotype in its isolation. If this Grandpa figure was one of many, stood aside a range of other vibrant characters with disabilities varying in age, then there would not be an issue. We know Lego is a creative power house. A place where the greatest playful minds create Wonka-esque building fun. We know they could conjure up the most amazing positive disability representation if they just left the stereotypes behind. Please Lego, think outside the box, do it for the kids!